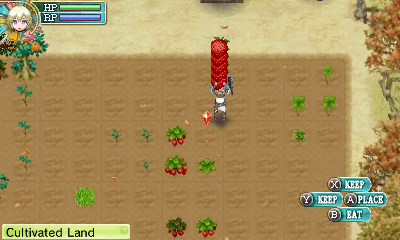 Let me start by saying this: Rune Factory 4 is still a fun game. But there is something I’ve come across in the past week that needs to be addressed. This is something I didn’t come across during my play-through for the review. There is a glitch in the game that happened while I was in hard mode. It happens when I either try to pick something up or pull something out of my bag through the L-Menu that opens when you hit the L Button. There are no issues in trying to equip a tool, weapon, armor, or magic. It’s just trying to hold items. This unfortunately has happened quite often. The game will freeze with the music shutting off and hopefully come back in a few seconds. However, I have had the game shut down on me twice. This happened a few days after selecting Hard mode and passing a number of festivals that I could’ve added to the calender. I also happened to have saved over my first play-through (oops) so that could’ve been a reason why it started happening. However, when starting a game from a different save file, this started happening when I tried to pick my first weed. This was well before I even made a selection for difficulty (which is made before you go outside the town for the first time). I know that it’s difficult to program stuff for the game with Neverland now gone (or at least that’s the story for why Rune Factory 4 isn’t coming to Europe any more). But I hope that XSEED and Marvelous AQL can come up with a patch to fix this potentially game-breaking glitch.